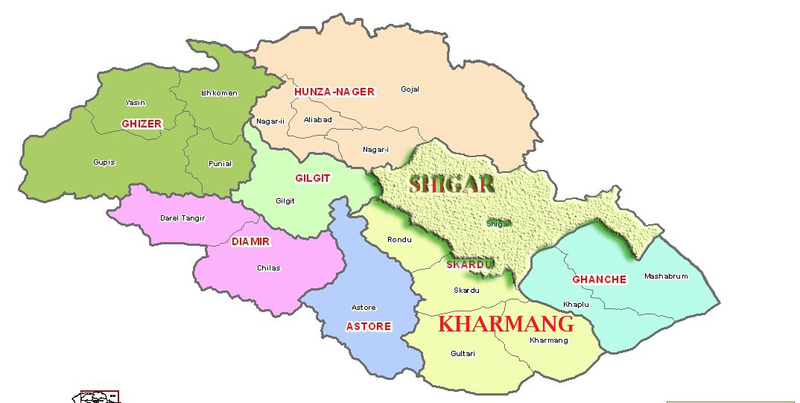 Skardu, March 21: Chief Minister, Syed Mehdi Shah, today announced the establishment of Shigar District in the Baltistan division of Gilgit-Baltistan region. Shigar will now be the 8th district of the region, the others being Astore, Diamer, Gilgit, Ghanche, Ghizer, Hunza-Nagar and Skardu. The Chief Minister also announced creation of Ghwari and Kiris sub-divisions in the Baltistan region. The announcement was made a huge public gathering in Shigar Pologround, attended by thousands of people from across the region. The establishment of Shigar district was a longstanding demand of the people of the sub-divison. Previously, Shigar was a sub-division within the Skardu district. The Chief Minister chose the occasion of Navroz to announce the decision. He is also likely to announce the establishment of Kharmang District within a couple of days, taking the total number of districts to nine. While the decision to make newer administrative units in the region is politically correct and popularly appealing, its financial viability is a big question mark. Already, the district of Hunza-Nagar and other administrative units have been facing severe difficulties due to dearth of financial resources. Provincial ministers and members of the assembly attended the ceremony along with government officials and local leaders. We would felicitate to the people of Shiger Baltistan on establishment of new district with the hope that all facilities they might have get at their door step. At the same time many burning questions arises related to leadership and management. First of all my question with leadership and management is whether this was the decision of house or individual. If this was decision of house then my second question would be what criteria were used to give top priority to shiger. If any criteria was not developed and randomly two districts are going to be announced in Skardu means the perception of GB people would be that CM is only in keen Baltistan. While I assume that this would be not individual decision. I also probed in the matter and analyzed the situation of Gb administratively and logistically. First of all I want to make it clear that the bogus facts and figures of GB are shared by some leaders and these bogus figures are used for planning as well as in daily usage. Here I want to show the real facts & figures of GB. After going through these figures the readers can decide that which area was potential & deserve for additional district. 7. Hunza – Nagar	98,760	1,41,991	70,995	Potential for 2 districts historical administrative perspective. After analyses of population the Gilgit district deserve for two districts, the Skardu comes on second number while there is no any discussion about Gilgit. While due to over crowd ness and mismanagement the Gilgit is becoming challenging for whole GB that needs to be pondered on it. My another view is that the successful Government would be called such government where the welfare of people is given top priority, principles of good governance are applied, meritocracy is honoured in all decisions whether it is from leadership side or management side, Islamic values and universal values are considered, the lives and property of common citizens are protected, corruption is discouraged and hated. The individuals as well as parties following and adopting these principles would be respected and honoured in GB for ever. After going through this detail discussions and analyzing facts and figures as a impartial social activist I came to conclusion that Skardu was potential for additional districts at second no while Gilgit stand first. Make every household a district & its head as DC. You dont have a single peny to pay salaries to the perminent employes and you are busy to creation of district. totally fail states or region in Pakistan. Not having paste the tables in above text it has been confusion for respected readers to comprehend the figures that is why as a sample further explanation is hereby made for reader’s interest. In serial no I in Gilgit district the population in 1998 was 1,48,000 while now in 2013 it is 2,12,785 and the average figure for additional district is 1,06,392. Compare to this the population of Skardu in 1998 was 2, 19,209 while now in 2013 it is 3,15,165 and average figure for 3 district is 1,05,055. Same elaboration has been made for other districts as well. At the end the population of GB in 1998 was 8, 83,799 while now in 2013 it is12, 70,670. Leaders and public generally assume that it is 20 lac which is not accurate. The correct figure is 12,70, 670. This calculation and analysis shows that Gilgit was potential for additional district while Skardu comes at second no. The leadership and top management better knows that how it has been announced and given top priority to Skardu. It would be appreciable in order to prove transparency if justification is made in public. well it is good to provide better services at their doorstep for the dwellers of GB. Here the facts and figures provided seems to be a good effort to compare but not authentic….! the comments posted earlier has no justification. “perception of GB people would be that CM is only in keen Baltistan”. Personally I don’t agree over this statement, if Mr. Mehr has this perception than how he can justify for the creation of 6th and 7th District during the past regimes of Ch Executives and why not Gilgit or Shigar District at that time???? Currently the present Govt. had made a good decision about Administrative region in GB (3 regions), and irrespective of any personality, I think we have a recognition (Gilgit-Baltistan). we should be hopeful for the best in coming future. As our region needs much attention to provide better health services and education by improving pragmatic policies and reforms…. Mehdi Shah and his corrupt cabinet has used its authority to appoint people on the basis of ethnicity and sect, as well as on the basis of region. This decision is nothing but an extension of the same biased and divisive strategy. It is strange that the CM could not arrange funds for Hunza-Nagar and Astore but he had all the time and resources to not only craft two new districts in Baltistan, but also allocate sufficient funds for them. He used his power to kill protesters in Chilas and Hunza for their legitimate demands. However, there are indications that the wheels will turn soon and the same cycle of selective and divisive governance will continue, churning more hatred and brining more weakness to the already fragile and bogus setup. Education should be priority before taking such decision. If poor people who do not have basic facilities like health and education, creation of district would not mean and cannot bring positive changes. I my opinion, If we see around Hunza there are huge potential to be new district which can be more beneficial for the betterment of Gilgit-Baltistan. – Criteria for establishing districts. Today in the daily news the CM sab has made it cleared that establishing district is not in his power this was pending case of former prime minister’s announcement. The PM has announced about many projects, like establishing professional colleges( Medical, Engineering) model cities, Extension of air ports etc but so far it was not followed. We would expect to implementation of these projects as well. The need is to revisit the existing administrative structure of GB and redesign an holistic Adm structure that devolves power and ensures transparent and efficent service delivery. I wonder if GB affords adminstrative costs to sustain traditional district with army of functionaries. It would be interesting to know operating cost of a typical district and self revenue generation?? ?